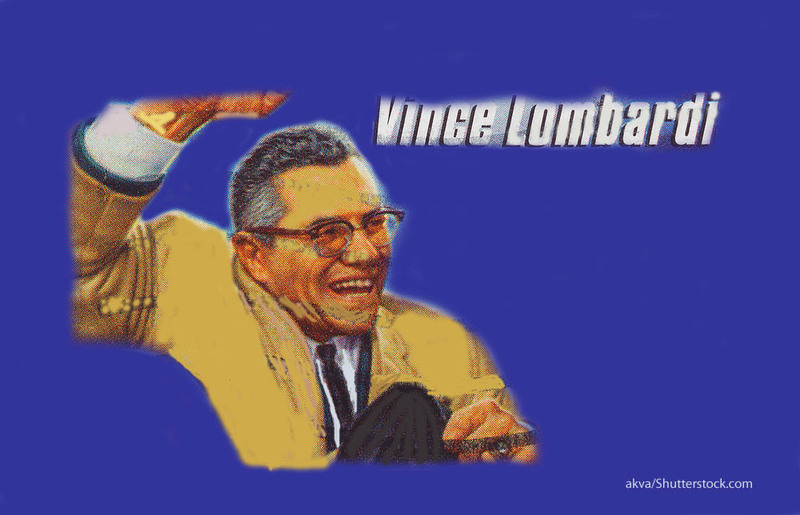 Vince Lombardi- "The quality of any man´s life is in direct proportion to his commitment to excellence." Anything is ours, providing we are willing to pay the price. There is a price you pay for victory. Success is paying the price. You´ve got to pay the price to win – to get there, to stay there. The most important element in the character makeup is mental toughness. Mental toughness is many things and rather difficult to explain. Its qualities are sacrifice and self-denial. Also, most importantly, it is combined with the perfectly disciplined will, which refuses to give in. It´s a state of mind – you could call it character in action. The will to excel and the will to win, they endure. They are more important than any events that occasion them. Success is not never falling, but in getting back up when you fall. Winning isn´t everything, it´s the only thing. The will is character in action. The succesful man is honest with himself. Success rests not only on ability, but upon commitment, loyalty, and pride. I´ve never been associated with a loser, and I don´t expect to start now. Success is not a sometime thing – it is an all-time thing. If you cheat on the practice field, you´ll cheat in the game. If you cheat in the game, you´ll cheat the rest of your life. I´ll not have it. Success is to be placed in a position of command, and the doctrine of command can be summed up in one word – leadership. Successful people are leaders, and leadership is the ability to direct people, but more so, to have those people accept it. I don´t like to use the term gambler´s instinct, but I´m willing to take a chance. There are occasions when being hard and tough, however, is the easiest way and the kindest way in the long run. We have to be hard sometimes to get the most out of our people, out of ourselves. Talent is not only a blessing, it is a burden – as the gifted ones will soon find out. Leadership rests not only on outstanding ability but on commmitment, loyalty, pride, and followers ready to accept guidance. Some of us will do our jobs well and some of us will not, but we will all be judged by one thing – the result. In a tolerant society, there is sympathy only for the misfit, maladjusted, criminal, the loser. It is also time to cheer for, to stand up for, the doer, the achiever, to recognize the problems, to recognize the winner. What we do on some great occasion will probably depend on what we are; and what we are will depend on previous years of self-discipline. The new leadership is in sacrifice, in self-denial. It is in love. It is fearlessness. It is humility and it is the perfectly disciplined will. This is also the distinction between great and little men. Leaders are made, and contrary to the opinion of many, they are not born… They are made by hard effort, which is the price we must all pay for success. To be a leader, you must be honest with yourself and know, as a leader, you are like everyone else, only more so. A good leader must be harder on himself than on anyone else. He must first discipline himself before he can discipline others. A man should not ask others to do things he would not have asked himself to do at one time or another in his life. You must identify yourself with the group and back them up, even at the risk of displeasing your superiors. I hold it more important to have the players confidence than their affection. The difference between success and failure is energy. You must believe that the group wants, above all else, for the leaders to have a sense of approval and that once this feeling prevails, production, discipline, and morale will all be high. Leaders are lonely people and, whether cordial or remote in manner, are destined to maintain a certain distance between themselves and the members of the group. A leader is judged in terms of what others do to obtain the results that he is placed there to get. I don´t want to seem ungrateful: I´m awful proud of you guys, really. You´ve done a hell of a job. But sometimes you just disgust me. I have been wounded but not yet slain. I shall lie here and bleed awhile. Then I shall rise and fight again. The title of champion may from time to time fall to others more than ourselves. But the heart, the spirit, and the soul of champions remain in Green Bay. The leader must always walk the tightrope between the consent he must win and the control he must exert. The real glory is in being knocked to your knees and then coming back… …We just have to button up our pride and we will come back. If a man who is considered a leader is to stay a leader, he must be prepared to adhere to his principles if he is certain, in his own conscience, that he is doing right. And when all is said and done, the leader must exercise an effective influence upon the people he leads. The degree to which he accomplishes this, I think, depends on the personality of the man: the incandescence of which he is capable, the flame that burns inside him, the magnetism which draws the hearts of other men to him. We are going to win some games. Do you know why? Because you are going to have confidence in me and my system. By being alert you are going to make fewer mistakes than your opponents. Each Sunday, after the battle, one group savors victory, the other lives in the bitterness of defeat. Many hurts are a small price. To the losers, no reason is adequate. To the winners, there is 100 percent elation. To the losers, only resolutions and determination. Winning isn´t everything, but wanting to win is. A team does not strive to pile up more points or develop a stronger defense or a manufacturer who is not always looking forward to the better product and marketing approach will find that someone else will come up with that better thing. We will never create a good society, until individual excellence is once more respected and encouraged. It has been an American zeal to be first in everything we do and to win, and to win, and to win. Today, we have a new ideology: to be homogenous – no grades – no classification – the only line drawn is passing or failing – no hunt for excellence. And you and I both know that this is the easy way, and the prevailing idea today is to take the easy way, that effort and work are unnecessary. Forget about the cracked rib. You don´t even need it. Once you agree upon the price you and your family must pay for success, it enables you to ignore the minor hurts, the opponent´s pressure, and temporary failures. Love everyone else. Love as one human to another, who just happens to be white or black, rich or poor, enemy or friend. The love I speak of is loyalty. The love I speak of is team-work, the love one man has for another. You may not be a tackle. You may not be a guard. You may not be a back. But you will be a professional. Everybody can like somebody´s strengths and somebody´s good looks. But can you like somebody´s weaknesses? Can you accept him for his inabilities? That´s what we have to do. That´s what love is. It´s not just the good thing. When those tough sport writers asked me what made the Packers click, I said, “Love”. It was the kind that means loyalty, teamwork, respecting the dignity of another – heart power, not hate power. All learning is trial and error. The negative experiences do not inhibit but rather contribute to the learning process. In my field we bring every man to think in terms of team effort. We develop a cohesive machine in which the color lines disappear and the various national origins are nonexistent. It is easy to have faith in yourself and have discipline when you´re a winner, when you´re number one. What you´ve got to have is faith and discipline when you´re not yet a winner. We want to perfect ourselves so that we can win with less struggle and increasing ease, but the strange thing is that it´s not easy wins we ostensibly seek but rather the difficult struggles o which we really look forward. Love is not liking. You do not need to like someone in order to love them. A man who blittles another – who is not charitable to another, who has no respect for the dignoity of his fellow man, who is not loyal, who speaks ill of another – is not a leader and does not belong in the top-management echelon. If a leader is sensitive to the emotional needs and expectations of others, the attitude toward the leader from the group will be one of confidence fused with affection. Adversity is the first path to truth. Prosperity is a great teacher; adversity is greater. Possessions pamper the mind. Privation trains and strenghtens it. In football and business, a leader must be honest with himself and the people he is working with. Skilled ignorance is often more powerful than knowledge and honesty – but only temporarily, only for a short time. In the long run the knowledge and honesty will pay off. Nothing is more venerable than loyalty. You don´t do what is right once in a while, but all of the time. Any kind of separatism is bad, in football or anywhere else. Character keeps on ticking, when the body fails. Simplicity is the sign of true greatness and meekness is the sign of true strength. Each of us must be prepared to adhere to his principles, if he is certain in his own conscience that he is doing right, if he is getting the job done to his satisfaction and to the approbation of the various publics he serves. He must develop a thick skin to criticism and let the caustic comments he receives from some quarters pass over his head. Our greatest glory is not in never falling, but in rising everytime we fall. Character, rather than education, is a man´s greatest need to safeguard, because character is higher than the intellect. Success is based upon a spiritual quality – the power to inspire others for good or for evil. Evil may temporarily succeed, but it always keeps within itself the seeds of its own destruction. The great hope of society is the individual character. If you would create something, you must be something. Teamwork is what the Green Bay Packers were all about. They didn´t do it for the individual glory. They did it because they loved one another. What is defeat? Nothing more than education, nothing but the first step to something better. It is defeat that turns the bones to flint and gristle to muscle and makes men incincible and forms those basic natures that are now ascendancy in the world. Do not be afraid of defeat. People who work together will win, whether it be against complex football defenses or the problems of modern society. The achievements of an organization are the results of the combined efforts of each individual. After the cheers have died down and the stadium is empty, after the headlines have been written and after you are back in the quiet of your own room, the enduring things that are left are the dedication to excellence, the dedication to victory, and the dedication to doing with our lives the very best we can to make the world a better place in which to live. Work and sacrifice, perseverance, competitive drive, selflessness, and respect for authority are the price that each one must pay to to achieve any goal that is wortwhile. The mature person puts first things first. I do not mean he is a sad sack. He knows how to live and laugh, to love fun. All right gentlemen, shall we arrange all of the stupid questions in any priority, or shall we take them all together? You´ve got to pay the price. Winning is not a sometime thing, it´s an all-the-time thing. You don´t win once in a while, you don´t do things right once in a while, you do them right all the time. Winning is habit. Unfortunately, so is losing. There is no room for second place. There is only one place in my game and that is first place. I have finished second twice in my time at Green Bay and I don´t ever want to finish second again. There is a second place bowl game, but it is a game for losers played by losers. It is and always has been an American zeal to be first in anything we do and to win and to win and to win. Every time a football player goes out to ply his trade he´s got to play from the ground up- from the soles of his feet right up to his head. Every inch of him has to play. Some guys play with their heads. That´s OK. You´ve got to be smart to be No.1 in any business. But more important, you´ve got to play with your heart- with every fiber of your body. If you´re lucky enough to find a guy with a lot of head and a lot of heart, he´s never going to come off the field second. Running a football team is no different from running any other kind of organization- an army, a political party, a business. The principles are the same. The object is to win- to beat the other guy. Maybe that sounds hard or cruel. I don´t think it is. It is a reality of life that men are competitive and the most competitive games draw the most competitive men. That´s why they´re there- to compete. They know the rules and the objectives when they get in the game. The objective is to win- fairly, squarely, decently, by the rules- but to win. And in truth, I´ve never known a man worth his salt who in the long run, deep down in his heart, didn´t appreciate the grind, the discipline. There is something in good men that really yearns for, needs, discipline and the harsh reality of head-to-head combat. I don´t say these things because I believe in the “brute” nature of man or that men must be brutalized to be combative. I believe in God, and I believe in human decency. But I firmly believe that any man´s finest hour- his greatest fulfillment to all he holds dear- is that moment when he has worked his heart out in a a good cause and lies exhausted on the field of battle- victorious.